Peel and cube garlic and onion. Heat oil in a pot and cook garlic and onion until translucent. Add rice and sweat in pot. Add wine, bring to a boil and simmer until the liquid has almost fully evaporated, stirring occasionally. Pour in enough broth to cover rice. Cook at low heat, stirring occasionally, for around 30 minutes. Do not add more broth until the rice has fully absorbed the liquid in the pot. Gradually add the rest of the broth. When all of the broth has been absorbed, fold in half of the wild blueberries. Season with salt, pepper and paprika. Fry the Halloumi for aprox. 5 minutes in a hot pan, turning occasionally. Wash and dry spinach. Shortly before serving, stir the spinach, grated cheese and remaining wild blueberries into risotto. Wash parsley and pat dry. 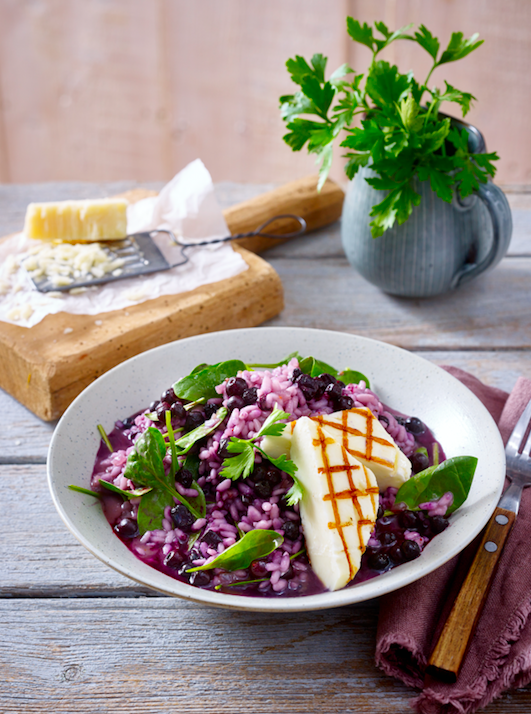 Arrange risotto and Halloumi in soup dishes. Garnish with parsley.